Recognizing the increasing importance of athletics and recreation in student life, the new Aimee and Patrick Butler Center for Sports and Fitness was built to replace an outdated pool and gym. 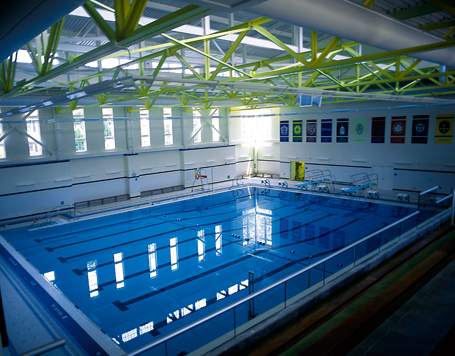 The natatorium’s 8-lane, 25-yard pool meets competition specifications for NCAA events and has both 1- and 3-meter diving boards. A sauna and spa on the deck level encourage recreational pool use. This facility was featured as an Architectural Showcase in Athletic Business Magazine in June of 1995.